Ah yes. Another delicious, seriously rich cupcake. One that you need a glass of milk to wash it all down with. If you are a connoisseur of cookie dough, like myself, then this cupcake is for you. 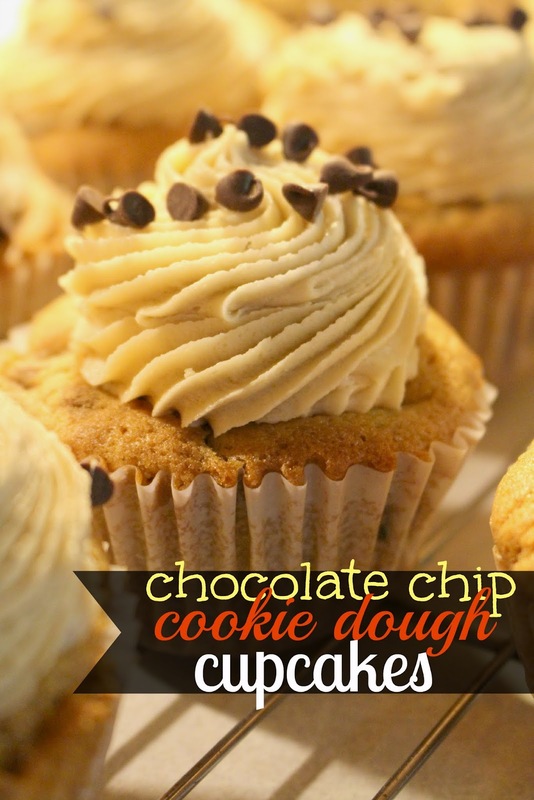 The cupcake is based off a classic brown sugar cupcake which ends up baking up a lot like a chocolate chip cookie would, if you add chocolate chips. Many people have different versions of a cookie dough frosting, but my personal favorite hails from annies-eats.com, again. The frosting she has incorporates brown sugar, flour, butter, and it just comes out delicious and rounds out the cupcake wonderfully. I mean, these cupcakes are wonderful. Just do not add up the butter content. Please, do not. There are multiple parts to it because in order for this to be chocolate chip cookie dough-ish, you need a cookie dough in the center. You can use any cookie dough recipe you prefer, just don't add the eggs, and you are in business! I make the inside, scoop the balls out onto the a cookie sheet lined with wax paper, and pop them in the freezer until I am just about ready to put the cupcake batter into the oven. The dough recipe for the center, you can half if you only want to make 24 cupcakes, but I tend to make the full recipe, as I have listed, scoop out only 24 balls to freeze, and then use the remaining to top my ice cream, or brownies, or just to eat. Or, just make it all into balls and freeze the remaining ones until you are ready to use. I just don't like to half it because it only would require half of a can of sweetened condensed milk then - and that to me is a waste. You can either bake the batter with the frozen dough in the center (this is how I prefer to do it) or you can bake up the cupcakes, then cut out the center and pop the unfrozen dough in after the cupcakes have cooled. As I mentioned before, I freeze the dough. When I add just shy of 1/4 cup of batter to each cupcake cavity, I then press in a frozen dough ball right before they go in the oven. The cupcake batter bakes up wonderfully around the cookie dough, as you can see above. Cream together the butter, sugars, vanilla, and salt. Add the sweetened condensed milk slowly, stirring to incorporate well. Using a small/medium cookie scoop, scoop out even balls of the dough to cookie sheets lined with wax paper and freeze for at least two hours. *Leave in the freezer until you are ready to put the cupcakes into the oven. Cream together butter, brown sugar, vanilla, and eggs (adding one at a time). Combine together the salt, flour, and baking powder. Add the flour mixture to the creamed butter mixture slowly, incorporating until no flour streaks remain. Using a large scoop or 1/4 measuring cup, add the batter to paper lines cupcake tins. When they are 2/3 full of batter, press one frozen dough into the center of each cupcake batter. Bake for 12 minutes, or until edges are golden brown. Remove from cupcake tin to cooling rack to let cool completely. Cream together the butter, brown sugar and vanilla. Add the powdered sugar one cup at a time until it is well combined. Slowly add the milk until frosting holds soft peaks. Garnish with mini chocolate chips, if desired.